Host Terry Jankowski checks the reservation list as attendees collect name tags and goodies. 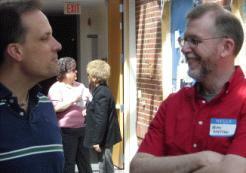 John Northup (l) and Brian Sweetman chat before the group convenes for the first demonstration, as A.G.O. members, in the background, do the same. 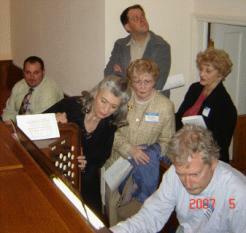 The 1949 Moller takes center stage as organist Michael Rosas (back left) watches with interest following his demonstration of the instrument. Organist Mary Holtzen introduces the 1953 Schantz to the group. 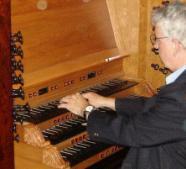 Terry Jankowski makes a point about the Casavant organ and its capabilities. 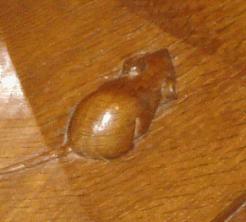 The Lutheran Home Chapel is overrun with these little critters, but that's a story for another time. The 1953 Schantz gets a going over by the group. the Walker at the Lutheran Home. 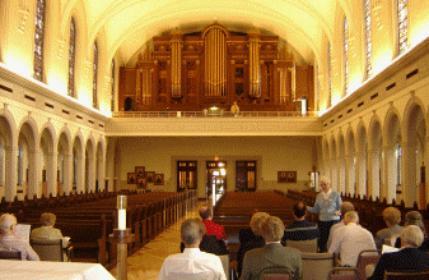 The Michigan Chapter convened in Monroe, Michigan at 2:30 p.m., in conjunction with an Organ Crawl co-sponsored by the Detroit and Toledo Chapters of the American Guild of Organists and the Michigan Chapter of the Organ Historical Society. The Michigan Chapter business meeting was postponed because of the crowded agenda of the day. 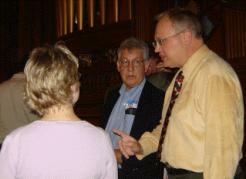 The day's Organ Crawl activities were ably organized and hosted by Terry Jankowski, organist at the IHM Motherhouse Chapel in Monroe. Michigan Chapter O.H.S. members attending were Carl Balduf, MaryAnn Balduf, Ed Price, Brian Sweetman, Mary Whitmore, Art Snook, Terry Jankowski and Jim Wilkes. 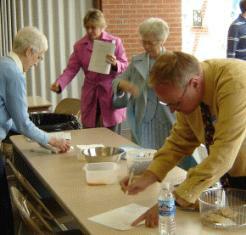 Following registration at St. Paul's United Methodist Church, with refreshments, Jankowski welcomed the group of 30 A.G.O. and O.H.S. members and introduced Michael Rosas, who demonstrated the St. Paul's 1949 Moller organ with no small measure of humor and aplomb. 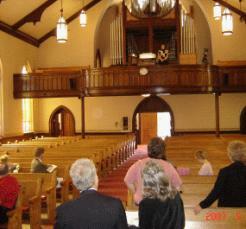 The next stop was Trinity Lutheran Church, where organist Mary Holtzen ably demonstrated the three manual, 30 rank 1953 Schantz pipe organ. 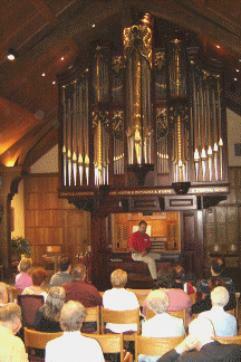 The third demonstration was that of a J. W. Walker and Sons three manual tracker action organ, exquisitely installed in the Chapel of the Incarnation at Monroe's Lutheran Home and enthusiastically demonstrated by Kevin Otter, Chapel organist. The final stop was the Motherhouse of the Sisters, Servants of the Immaculate Heart of Mary. Following an excellent Spaghetti dinner, the group convened in the Chapel, where Terry Jankowski demonstrated the magnificent 62 rank Casavant Freres organ. 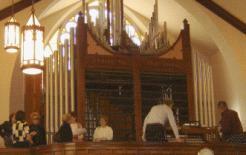 Terry Jankowski is dwarfed by the huge Casavant organ as a Sister provides background on the Chapel and the 62-rank organ. 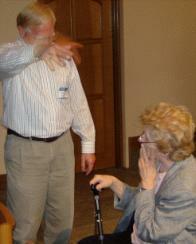 Kevin Otter provides background information before playing the Walker tracker at the Lutheran Home. 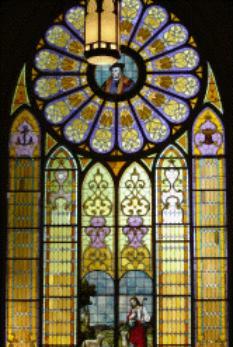 Stained glass at Trinity Lutheran is worth the trip! OHSers Art Snook and Jim Wilkes compare notes. Ed Price checks out the Walker. Is Ray Stillwell really casting a spell over Mary Whitmore? Seems so, anyway. Balduf, Price and Mary Holtzen enjoy a laugh. A pleasant time at dinner at the Motherhouse.